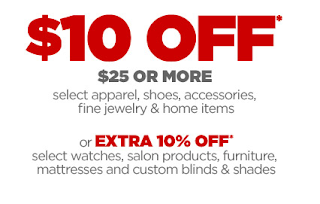 Now through July 12th (Sunday) you can save $10.00 off your $25.00 purchase at JcPenny! It's good for select apparel, shoes, accessories, fine jewelry and home items. If you are looking to start some back to school shopping for clothes or shoes this is a good time! Click on the picture below to get your coupon that you can print or show on your mobile device!